My 32nd birthday is coming up next month and although it’s not a year that ends in a -0 or a -5, it is still a pretty big year for me. I definitely feel more mature than I did when I turned 30, but I’m still not ready to mark adulthood with bringing a human child into the world (we are considering another canine child – more on that later.) Aaron and I are finally feeling somewhat settled. The wedding planning and house renovations are behind us and we’re at a point where we want to enjoy each other. We just got back from a 3-week trip around the world, so I know that another trip is out of the question. I’m not quiet sure if I feel like having a big party to celebrate my day of birth. The next best thing to commemorate my 31st year and celebrate what year 32 has to bring is with a piece of fine jewelry. For me, jewelry has always and will always be very sentimental. When I look at a piece of jewelry, I am taken back to the moment of my life when I received it and immediately it brings up memories of the people tied to it, especially if it is passed down by a loved one. I hope to have pieces of jewelry that I can pass down to loved ones too. Robbins Brothers, the engagement ring store, was kind enough to let me borrow some rings for this shoot and play around with the styling of the rings. I wanted to share with you, and also Aaron, how I can incorporate these rings into my current wedding band and engagement band set. Often times when a woman gets engaged, their man or the couple together zero in on the engagement ring and don’t think about the whole picture, which includes a wedding band or a couple wedding bands. If you and your boyfriend are thinking about getting engaged, you’re already engaged and you’re not sure what wedding band you want, or if you’re thinking about adding color or sparkle to your current wedding set, take a look at the options below for some inspiration. It’s been over five years since Aaron and I first went ring shopping. It’s amazing that my same Tacori engagement ring and wedding ring set is still available in stores. I love how classic the style is. 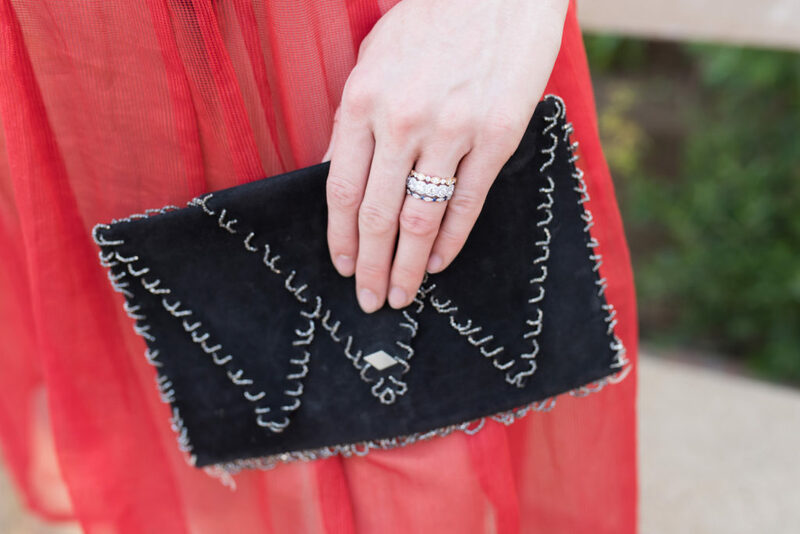 Aaron knew that I loved the vintage engagement ring look, but he was not in love with the prices or the fact that older rings have little to no history on the diamonds. He found this Tacori engagement ring in a magazine and took me to the only jewelry store in the Valley (at the time) that had it available to try on. I immediately fell in love with the matching wedding set. The only thing that was hard for me was committing to a white gold engagement ring and wedding ring. Back then I mostly wore yellow gold and now I wear a ton of rose gold. With this specific setting, it has a classic appearance with the white gold that matches everything. I also knew that platinum isn’t the metal for me since I’m so hard on my jewelry. 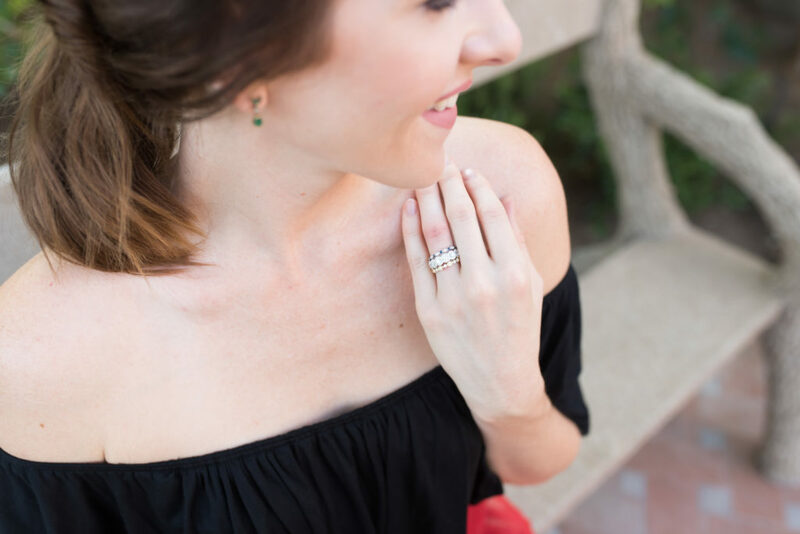 Through our engagement ring discussions, I made sure that Aaron knew that eventually I would want a colorful band or a few bands to incorporate into my wedding set or to have as a secondary wedding ring. With my birthday coming up, and our 4 year anniversary in January, these delicate wedding bands are the perfect present. The price points are great if Aaron wants to space them out and purchase one for each celebration, or he could purchase two or three as one gift. 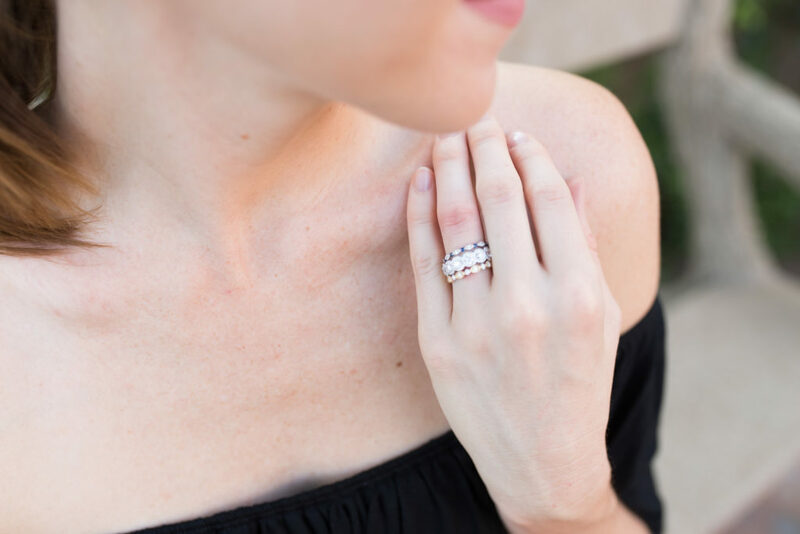 I am obsessed with the stacking trend and having such delicate wedding bands, you really can include five or so rings without feeling like it’s too much on one finger. In the photos above, you can see that I chose a rose gold ring, a white gold ring with blue sapphires to include my favorite color, and a yellow gold band. I love how subtle the color is, but it really does create a very special stacked wedding set. If you already have your wedding set and would like to incorporate more color, you can easily wear all five rings every day or switch out one or two of the rings depending on your mood or your outfit. For this look, I chose to wear all five because I would only wear this outfit for a special occasion and if you asked my Grandma she’d say that a special occasion calls for as much jewelry as you can possibly wear! There are no rules to wearing wedding bands and it seems like the more personality you can put into your wedding stack the better. My absolute favorite wedding band look is the middle wedding band that I’m wearing in the photo above. Recently, I’ve found myself gravitating to this multiple diamond look. I would never want to replace my solitaire engagement ring, but I find myself dreaming of one day owning this ring. 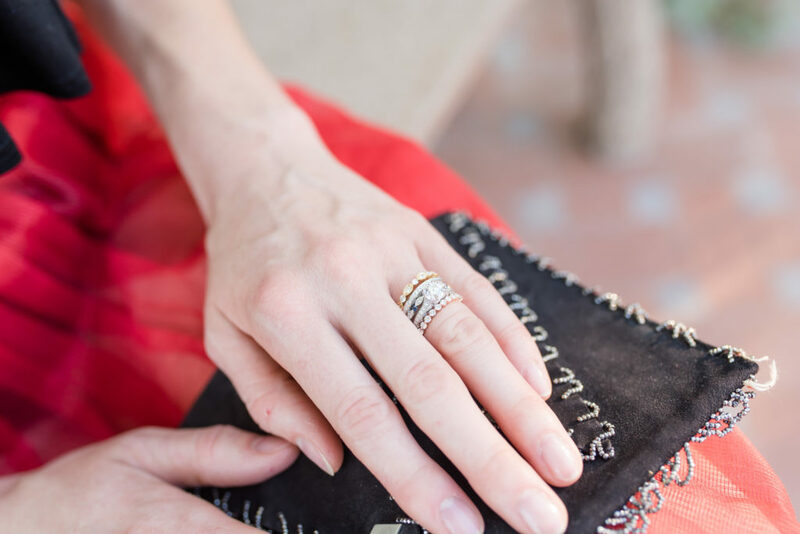 The great thing about this style of ring is that it can be worn as a right hand ring, or it can replace your engagement ring and wedding band on those days when you want a low profile. It doesn’t happen often, but occasionally my solitaire ring will catch on something and I wish I had a ring that was more flat to my skin. The great thing is that although this ring is a little bit on the pricier side, you can add one of these colorful bands for under $1,000 to make a unique set. This is definitely the appropriate ring to celebrate a monumental event, like a push present, a 5 or 10 year anniversary present or one of those birthdays that end in a -5 or a -0. I hope the styling of these rings has inspired you! 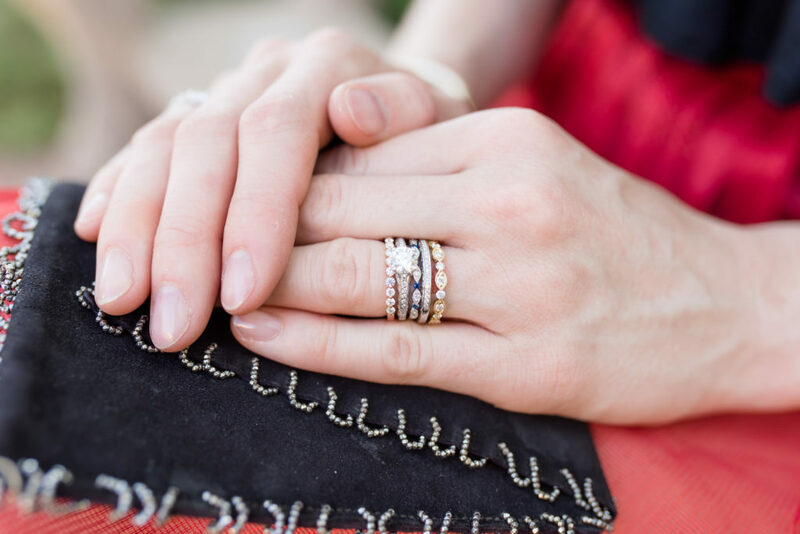 What trend do you see yourself gravitating towards more; the stacking trend, multicolor trend, or the low profile multi-diamond wedding band? Leave your comments below! Disclaimer: I was given a gift of appreciation for my recap of these gorgeous rings, however that does not change what is written is my own personal opinion based on my experiences. Not gonna lie. I want/needtbat Henri wedding band!! 😍 lol I sent that band to my bf!! Happy early birthday! That is awesome! Which one do you like the best? They’re all so gorgeous! Thank you for the birthday wishes 🙂 You and your bf should go to Robbins Brother’s and meet with someone to learn more about engagement rings if you haven’t done so already. They are so knowledgeable about diamonds and fine jewelry in general. LOVE your bling bling bling, especially the stackable set!!! Wow!! These are all gorgeous!!! I love stacking rings! Thank you for reading my blog post! These are such beautiful and elegant rings! I love how delicate they are! Me too! It makes it so easy to wear multiples! These are gorgeous photos!! Stackable rings are my favorite! Thank you! I’m glad to hear that they’re your favorite too. I hope you have an amazing birthday! This is such a beautiful arrangement. Also I really like that skirt. Thank you so much! I’m so glad you like the skirt 🙂 It was a bold move to wear something see-through! These are gorgeous! I love stackable rings.